I am a Graphic Designer based in Fife with a slight addiction to tea & candles! Born in the Rhondda Valleys, South Wales, my parents & I moved up to Bonnie Scotland when I was 6 years old. Although I am Welsh, I am now referred to as the ‘Schwelsh’ one because of the Scottish twang in my accent & nobody back home being able to understand me. After having my son, I needed to be in job that was more flexible for my family. I had worked in retail for 11 years & knew that wasn’t where I wanted to permanently remain. My son really gave me the drive to start my own business in the creative industry, where my interest had always been since childhood. While at college qualifying as a Graphic Designer, I quickly realised that my passion lay in wedding stationery, and all the details behind it. This is when ‘Laura Reece’ was born. I love the whole process from meeting new clients, discussing ideas & inspirations to bringing designs to life. No day is the same as the other & that’s what I love. 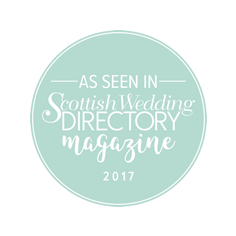 We are lucky enough to work with some amazing suppliers & venues throughout Scotland. To find out who we rate just click: Recommended suppliers & Recommended venues. Photographers, videographers, florists, pipers, cakes & more... we've got you covered!